The Swarovski Turtledoves ‘Amour’ was the third and final Swarovski SCS crystal figurine in the “Caring and Sharing” trilogy. The Swarovski Turtledoves were another spectacular piece of art. 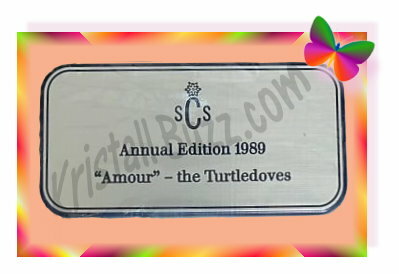 A title plaque for the 1989 SCS annual edition was available to SCS members for the AE Turtledoves, but was a separate purchase. The Turtledoves Plaque is identified using reference # SCMRP89, which was originally used in the Warner’s Blue Ribbon Books on Swarovski Catalog of recommended insurance values. We wish to extend a thank you to Jane Warner, co-author to Warner’s Blue Ribbon Books on Swarovski for consulting on the Swarovski Turtledoves Plaque article. The SCS Swarovski Turtledoves Plaque can be hard to locate to determine approximate replacement cost. Crystal Exchange America, presently has a single listing for Swarovski Turtledoves Plaque that is over $200 with their commission, but being a new listing, it does not yet appear in their store inventory. No completed auctions were found within the past 9 months there or in the online auctions to determine actual resale prices.